Monarch Air Group provides private air charter in Copenhagen, Denmark. Our clients benefit from top-notch service, unrelenting dedication to safety, wide selection of aircraft, and years of experience in chartering private jets. To obtain a free quote, please use our online quoting tool provided below, or call toll free 1-877-281-3051. Monarch Air Group offers private jet charter services to and from Copenhagen, Denmark. 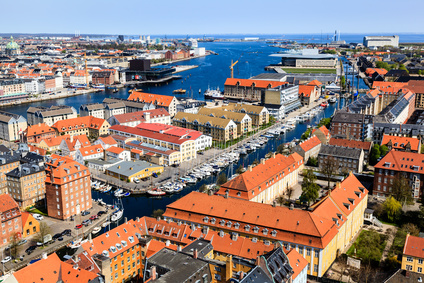 Situated partially on the islands of Zealand and Amager, Copenhagen is the capital and largest city of Denmark. Originally a fishing village and a major Baltic port, today Copenhagen is the main cultural, business, media, and science center in the Scandinavian-Baltic region. There are world and regional headquarters Dell, Microsoft Development Center, and Nokia, the world’s largest container shipping company Maersk Line, and Danish pharmaceutical companies Bavarian Nordic, Ferring Pharmaceuticals and Novo Nordisk. Being one of the premier destinations in Northern Europe, Copenhagen is a beautiful, vibrant, and modern city with breathtaking modern architecture, luxurious restaurants and cutting edge design. The most popular tourist attractions include Tivoli Gardens, the Copenhagen City Museum, the National Museum, the Museum of Decorative Arts, the National Gallery, the Louisiana Museum of Modern Art, the Ny Carlsberg Glyptotek, the Nyhavn Canal, the Rosenborg Castle, the Little Mermaid, Freetown Christiania, Legoland Billund, the Christiansborg Palace, the Bakken Amusement Park, the Copenhagen Zoo, the Denmark Aquarium, and the Eskperimentarium. With its rich history full of historical buildings and ancient streets, its renowned museums and galleries, Copenhagen attracts tourists from all parts of the world.